English Heritage provide a summary of the results of radiocarbon dating. A collection of paintings of Stonehenge, Avebury and the Rollright stones by British artist Jane Tomlinson. A campaign against upgrading the A303 road through the Stonehenge World Heritage Site, Wiltshire, England. Bart Jordan explains connections between the 28 night lunar/menstrual cycles and 56 holes at Stonehenge. Photographs of the monument by visitor Ron Spohn, part of Cyberranch. Andy Burnham provides images of Stonehenge and details of stone circles and other prehistoric monuments threatened with development, and what you can do to help. Stonehenge News is a resource for the history and current events surrounding the site. Who built the Stonehenge megalith and why, has yet to be solved. Was it Merlin, the Druids, extraterrestrials? Is Stonehenge a doorway into the future? Stonehenge has long held a fascination for the mystically inclined- and so it was only natural that those within the counterculture who believed that the ancients situated their sites at places containing special powers would want to hold a festival there. Britannia provides an illustrated history of Stonehenge with more details on “how they did it” than are provided in our article, plus brief overviews of theories about the builders and legends associated with Stonehenge. Encyclopedia entry on the construction and theories of Stonehenge. Christopher L.C.E. Whitcombe of Sweet Briar College provides an overview of the history and possible purposes of Stonehenge. Illustrated article on Stonehenge, featuring lengthy quotes from Christopher Whitcombe. Article about what we know and what we don’t about Stonehenge. Chrisopher L.C.E. Whitcombe of Sweet Briar College provides an overview of the theory that Stonehenge was built by ancient Druids and a thorough history of modern Druid worship at Stonehenge. 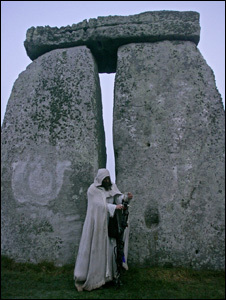 Includes several images of Druid ceremonies at Stonehenge. Short article about pagan worship at Stonehenge in ancient times and today. Article about modern Druids and other pagans working for the right to keep Stonehenge a working temple and not just a tourist attraction. Displays a large collection of photos of recent solstice celebrations at Stonehenge. The History of Stonehenge BBC animation of the monument’s construction. Stonehenge, a Temple Restor’d to the British Druids By William Stukeley, at Sacred Texts. I don’t know if this link would be useful to your blog readers. It’s a project created between the Stonehenge Riverside Project, Bournemouth University and Google Earth. It’s a Google Earth add-on application that lets you tour Stonehenge virtually with insights from recent archeological finds. You need to have Google Earth already installed on your computer, then download the Stonehenge app and open the folder in Google Earth. It’s a really fun tool. I hope you don’t mind me adding a link. There aren’t many Stonehenge novels out there, and I have tried to depict the people–their dress,weapons, houses etc as realistically as possible within the medium of fiction, as well as including recent archaeological finds such as those at Blick Mead (Vespasian’s camp) and Bluestonehenge.